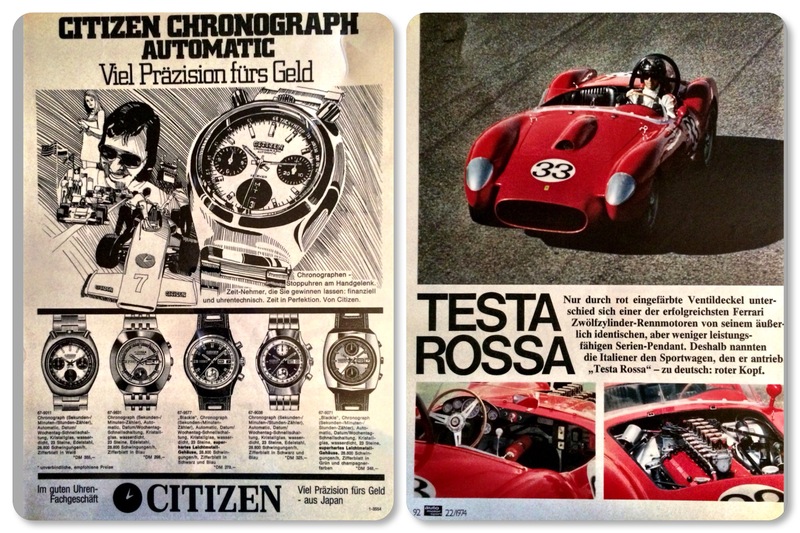 One lucky find was this page from Auto Motor Sport magazine from 1974. 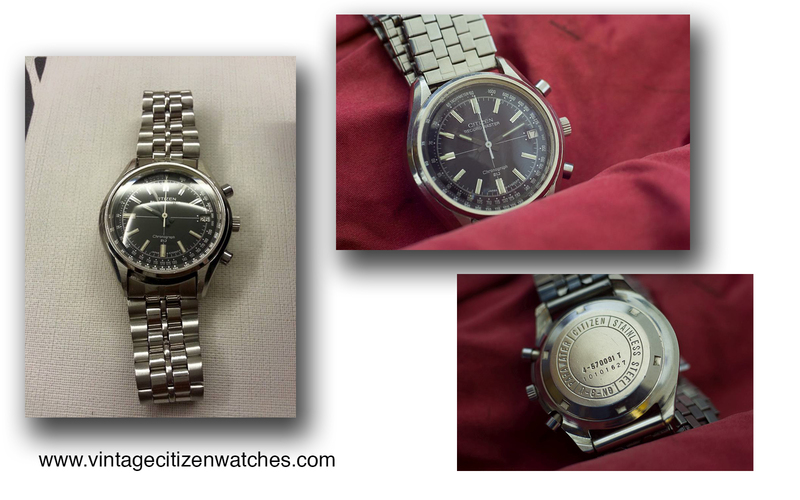 It says “Citizen Chronograph Automatic” and “A lot of precision for the money (at this price)”. So, we have a racing automatic chronograph that is not too expensive and still very precise. The race on! These are the designs that were used at the time. My favorites are not here (The Walter Wolf and the Octagon bullhead). 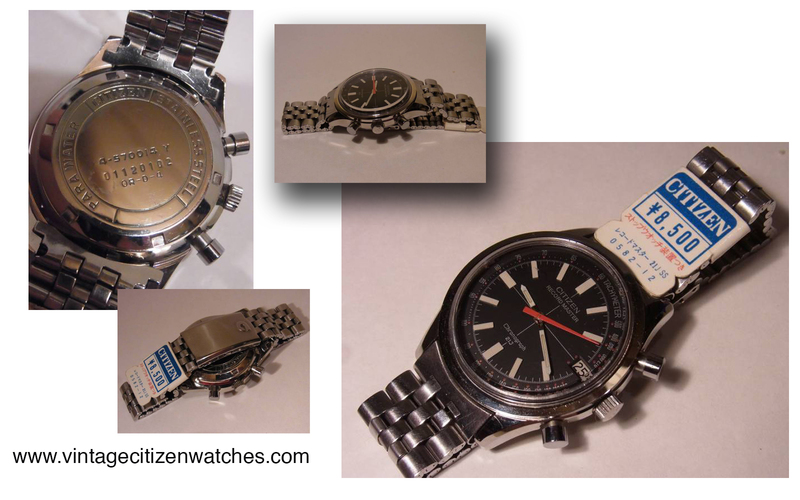 The next models are represented, with their prices in DM at the time (year 1974). 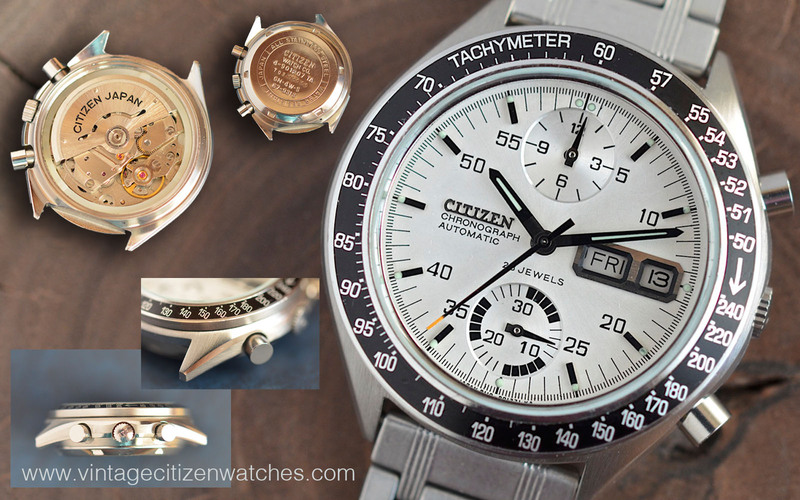 One of my favorite Citizen chronographs is the 67-9151 model. I wrote before about a custom project based on this model HERE. This time I will write about the all original one. The watch was found in a bad shape, really scratched and dirty. 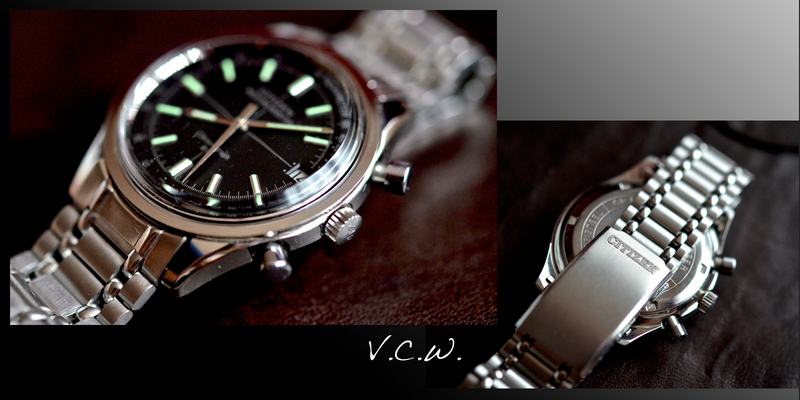 But even underneath that scratched crystal there could be easily observed the beautiful original green dial. For this model there are available only three dial variations, as seen in the catalog picture below. 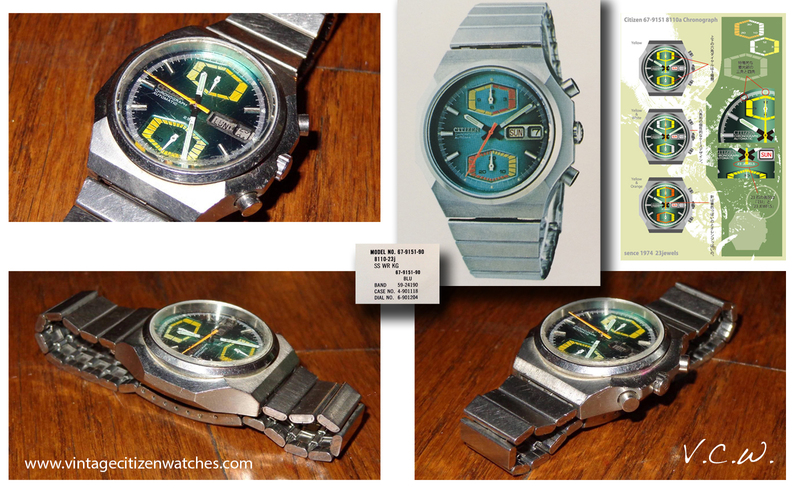 The caseback was never removed in the past 30 years. The movement stopped a long time ago and the pushers were not moving. 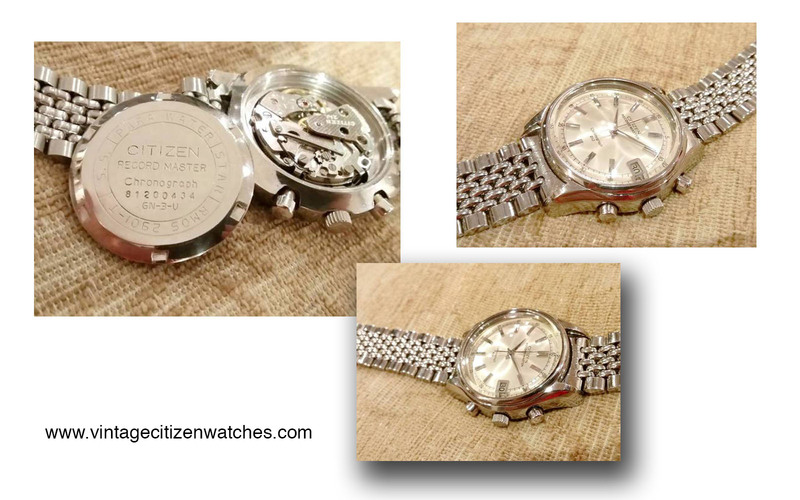 The restoration process started by removing the caseback and the dedicated bracelet. 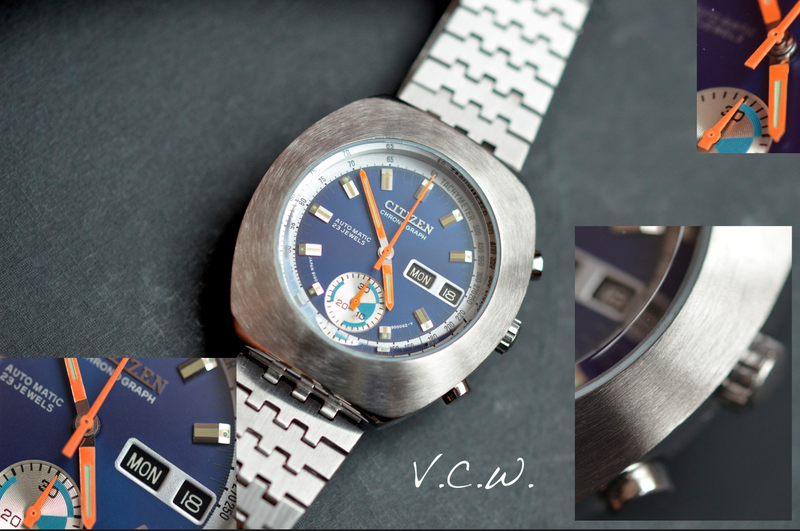 The design of the stainless steel bracelet fits the octagonal watch case perfectly being made for this model only. After removing the bracelet and the clasp, it was time for the movement to come out. The calibre 8110A was serviced and now it is running strongly, as it should. It is a flyback mechanism and features a day – date complication too. It is an automatic movement, with 23 jewls and hand winding capability. 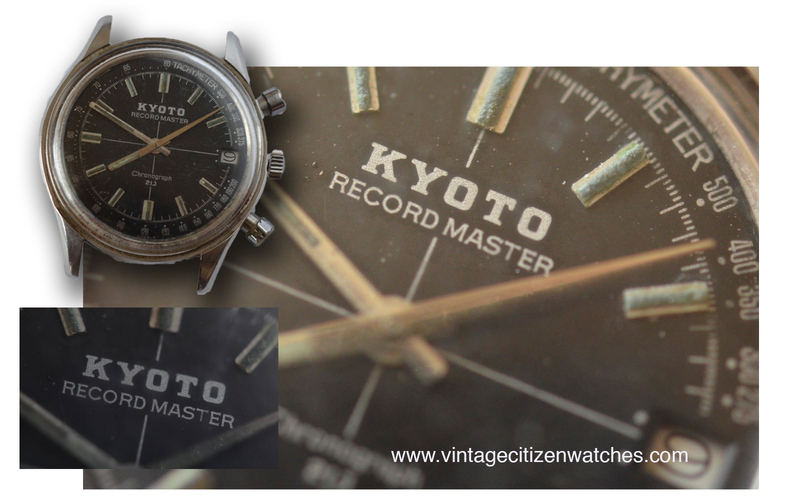 It was produced by Citizen starting from 1972. It is a vertical clutch chronograph (beating at 28.800 bph) with column wheel and fly back function. The fly back function means that you can reset the chronograph while in motion and it will start again without needing to go the entire process of pressing stop-reset-start. So, one push can do all of this. A particularity for this movement is that when you want to change the day you should pull the crown to second position (for changing the date) and push and release the reset (1 o’clock) button. The column wheel/vertical clutch design of the movement advices to leave the chronograph running for most of the time (this way you can also see the beautiful sweeping central second hand in movement), but from time to time it should be stopped. The dial is the main attraction of the watch, and that says something about it. The overall sharp, angular shape of the watch is mirrored in the mesmerising details. The green color is not plain at all but lighter and shinier in the centre and darker at the 3 and 9 sides. The chronograph sub-dials are hexagonal with 3 variations: yellow-white, yellow-orange and all yellow. The seconds hand for the all yellow version is yellow too while for the other two is orange. At the end of the restoration we have a newly brushed/polished strap and case, fully functional movement, and a new mineral crystal. What a beautiful watch! 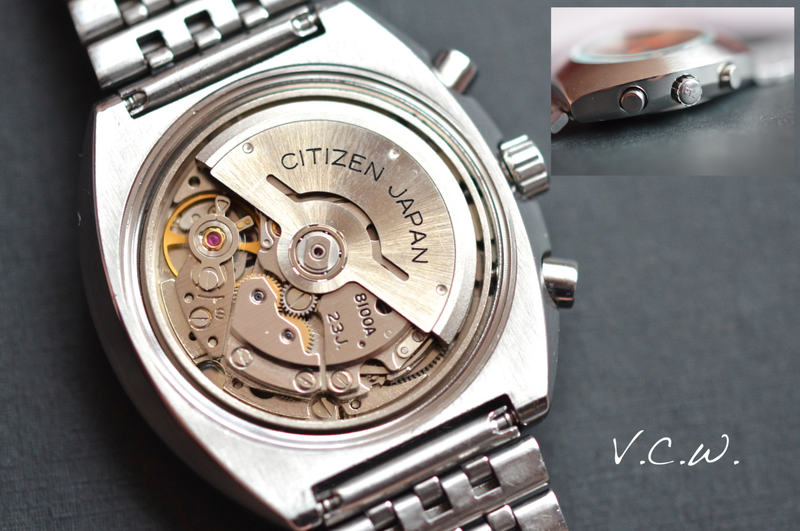 This is the most common vintage automatic Citizen chronograph movement in one of the rarest case design, with one of my favorite Citizen bracelet. 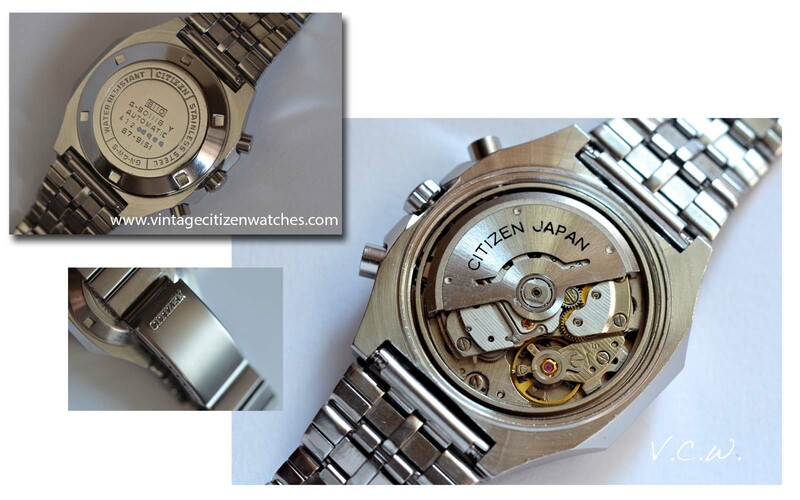 The reference number on the caseback is Citizen 67-9151. 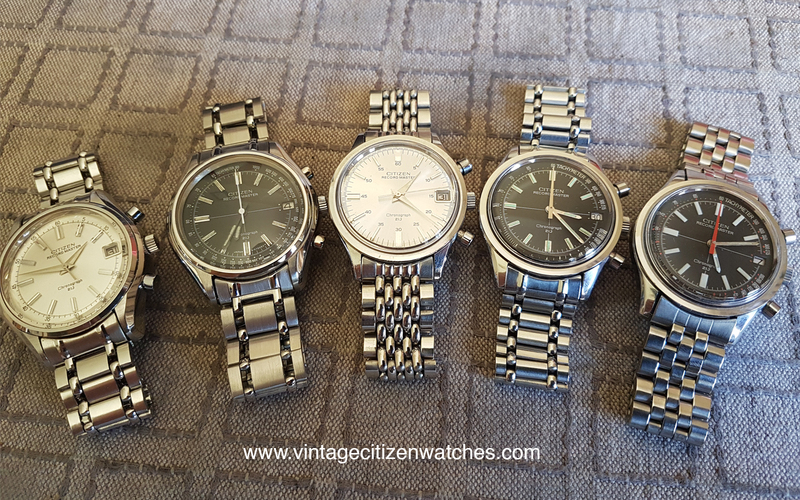 Due to the lack of information regarding vintage Citizen watches, sometimes we get some watches that are actually Custom Project watches (marriage watches, or just plain fakes). Sometimes the strap doesn’t belong to the watch or the case is not from the same model with the dial. This doesn’t mean the end result is not a beautiful watch but is not true to the original model. 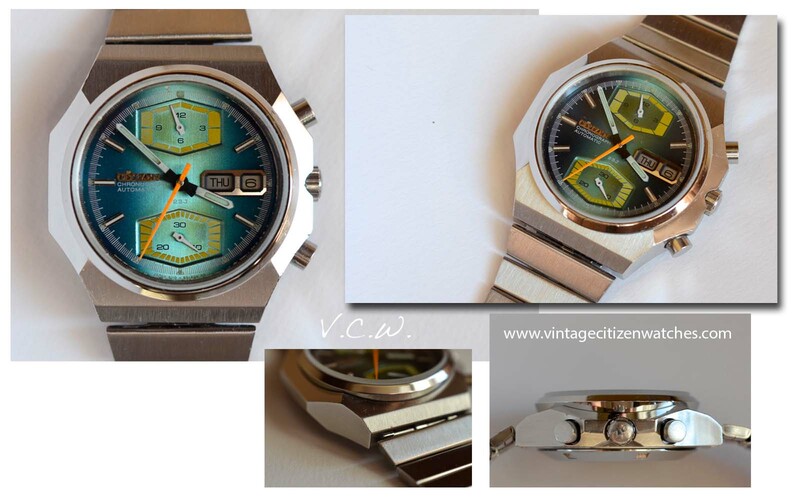 Such a watch is this one, a watch made by a watch collector, a vintage Citizen lover who tried to create the best Citizen he could. All the parts are original Citizen. 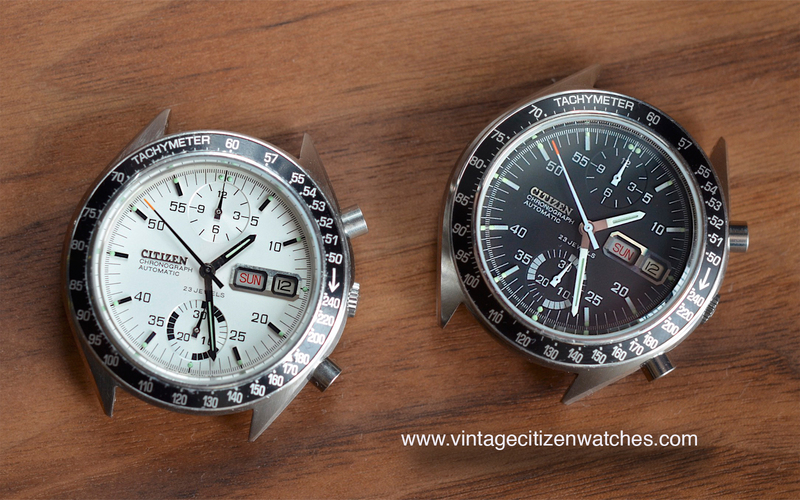 Regarding the shape, you can instantly see that this is not like all the other chronographs. This one has a beautiful octagonal shape that gives it personality, masculinity and a lot of style. 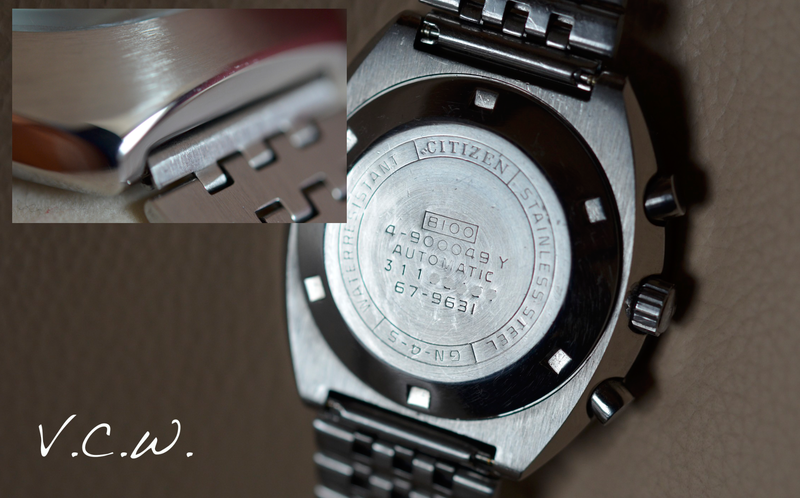 The case is made of brushed and polished stainless steel and the case back screws into place, model Citizen 67-9151. The round bezel is polished and the glass crystal is flat. The shape of the watch is octagonal. The winding crown is signed “CTZ”. The case alone has different surfaces, not counting the bezel, crown and buttons so the visual effect of brushed and polished surfaces, with a lot of angles, gives a powerful feeling. The dial is classic, with two contrasting subdials positioned at 12 and 6. 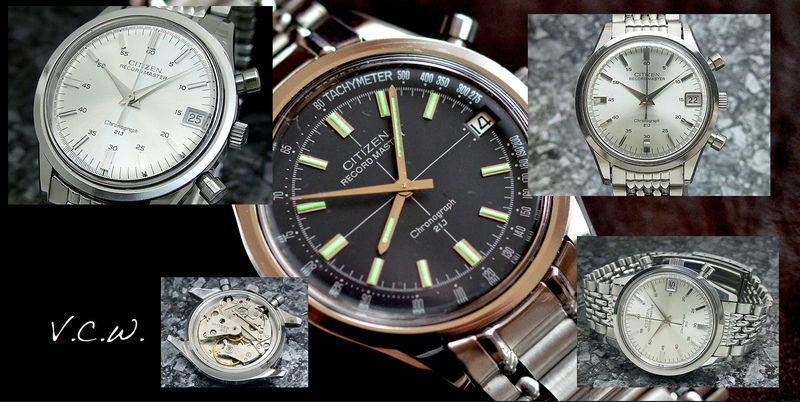 A lot of “restorations” are with aftermarket dials, so pay attention on this aspect when thinking of buying a Citizen chronograph. The subdial at 6 counts the elapsed minutes (30), the one at 12 – the hours(12) and for the seconds we have the red central sweeping hand. The day is in two languages (German and English) and Sundays are painted red. On the outside of the dial we have the classic tachymeter scale. 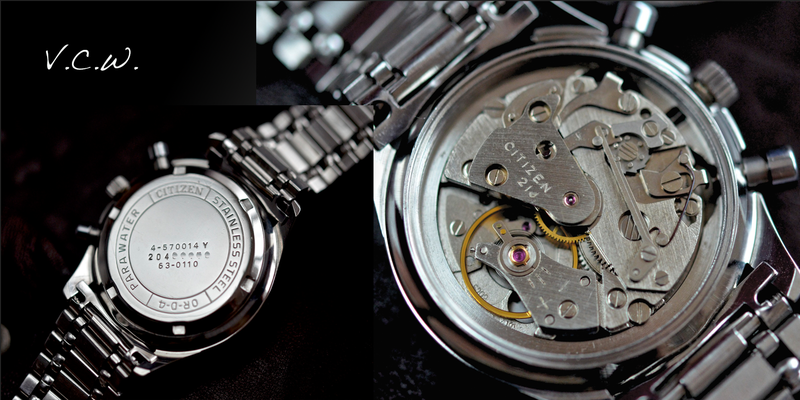 The movement is the Citizen automatic, 23 jewls, calibre 8110A with hand winding capability. 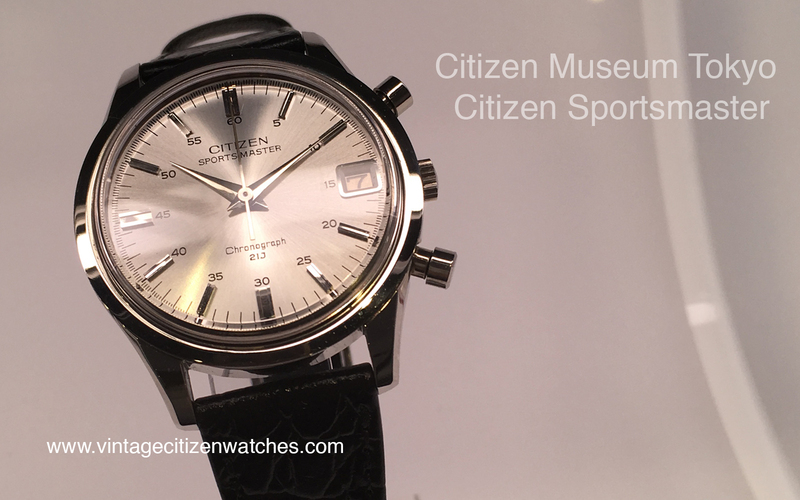 It was produced by Citizen starting from 1972. It is a vertical clutch chronograph (beating at 28.800 bph) with column wheel and fly back function. 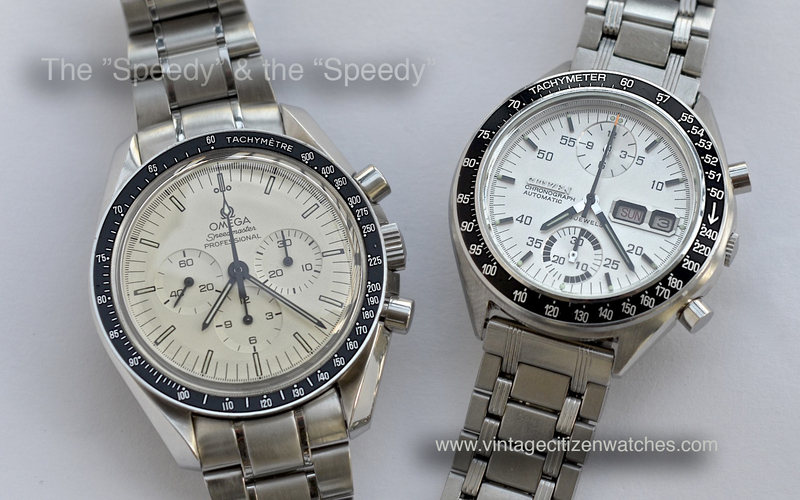 (how many modern chronograph do that, and what is their cost?) Lets don’t forget it has a day and date indicator. The fly back function means that you can reset the chronograph while in motion and it will start again without needing to go the entire process of pressing stop-reset-start. So, one push can do all of this. Of course that if you want to stop it you can go the classic stop-reset way. A particularity for this movement is that when you want to change the day you should pull the crown to second position (for changing the date) and push and release the reset (1 o’clock) button. It is 27 mm wide and 6.9mm high. The column wheel/vertical clutch design of the movement advices to leave the chronograph running for most of the time (this way you can also see the beautiful sweeping central second hand in movement), but from time to time it should be stopped. This is a chronograph that needs to be used. It is not made for design purpose but for timing. The bracelet is one of my top favorite design from Citizen is stainless steel, wider where it connects with the case and narrowing towards the signed “Citizen” stainless steel clasp. The links are made of solid pieces, not folded. Conclusion: Beautiful to wear, beautiful to look at, interesting special design, wonderful automatic fly back chronograph movement that needs to be used… what else to ask for a chronograph? 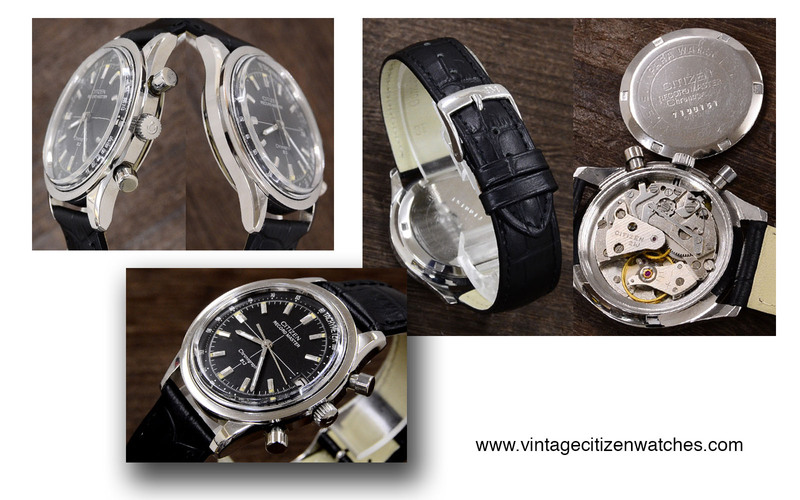 Don’t forget to pay a lot of attention when buying your Vintage Citizen Chronograph! A lot of them are beautiful but not original!